Habits lay the foundation for short- and long-term success with our health, wealth, and happiness; therefore, it’s critical to carefully examine our repetitive behaviors and thought patterns. They’re either moving you closer to your goals or farther away from them. I’ll admit that breaking old habits and forming new, beneficial ones isn’t easy. But one way to create more financial success is to begin layering simple micro habits into your routine that require minimal effort and motivation to complete. You already have many tiny daily habits, such as brushing your teeth or taking vitamins. Any small step that allows you to stop a negative habit or start a positive one is a micro habit. They take up little time, but can build up to huge, significant results when you make them part of your routine. 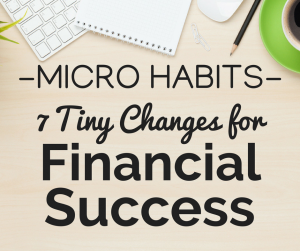 Here’s how to use seven micro habits to create more professional and personal financial success. 1. Listening to 15 minutes of audio. Everyone has 15 minutes of daily downtime, such as when you get dressed, shave, put on makeup, fold clothes, take a lunch break, or commute. That’s the perfect opportunity to listen to a great podcast or audiobook that improves your life. No matter if you’re an employee or have a business or side gig, find audio content about your industry so you can stay up-to-date. Or seek topics like customer service, e-commerce, or marketing to find more customers and serve clients at a higher level. Choose anything you want to start doing better and find expert content that moves you forward with information and motivation. The beauty of podcasts and audiobooks is that you can consume portions when you have small windows of time and then pick up where you left off. Start by listening to something new that interests you for just 15 minutes and see how you can incorporate it into your day on a regular basis. When you surround yourself with positive information, it’s easier to stay informed and inspired. You never know where the information may take you. Listening is a fun way to make small, incremental life changes that make you a little bit better every day. Free Resource: Laura’s Money Girl Podcast—subscribe for weekly information and inspiration to earn more, save more, and live a richer life! 2. Reading one page of a book. With so much digital and social media fighting for our attention, making time to read physical books can seem daunting. But reading the old-fashioned way has so many benefits that you don’t get from reading on a device. Research suggests that reading electronic text can slow you down by 20% to 30% compared to the speed you read a real book. Feeling the paper and flipping pages creates a deeper sensory experience that helps reading comprehension and remembering what you read. Create a micro habit to read just one book page a day. While this might seem like a ridiculously tiny goal, that’s the point. If you read one page, it’s likely that you’ll read several—but it’s okay if you don’t. Taking a long time to read a book is better than not reading one at all. Build this micro habit into your early morning or nighttime routine. I love snuggling up with a good book to relax before going to sleep. Getting engrossed in a great book can help you learn, reduce stress, and be a signal to your brain that it’s time to wind down. 3. Going to bed 30 minutes earlier. Your health lays the foundation for what you can achieve with your money and life. If you’re not taking care of your body, your mind will also suffer. In addition to maintaining a good diet and regular exercise, try going to bed 30 minutes earlier. That extra time might allow you to read a book before drifting off or get a better night’s sleep. I love watching TV with my husband after dinner, but I try to limit set a limit of one hour or two. As fun as it can be to stay up late watching your favorite TV shows, it’s probably not helping you achieve your goals. Instead, begin your bedtime routine a little earlier so you can wake up feeling recharged, focused, and able to accomplish more. You only have one life, so don’t make a habit of wasting time. 4. Buying quality instead of quantity. Micro habits to pare down your possessions and enjoy them more are always worthwhile. Consider buying less stuff, but choosing higher quality items. It’s easy to get in the trap of buying lots of clothes, shoes, or home furnishings because they’re on sale or seem like an irresistible “bargain” in the moment. I love a sale as much as the next person, but I find that when I buy higher quality items, I cherish and take better care of them than I do for cheap stuff. I use a “one in-one out” rule that forces me to sacrifice a similar item when I buy something new. For example, if buy running shoes, I need to sacrifice an old pair. Got a new top or pair of jeans? I must pick one that I haven’t worn in the past year to donate to Goodwill. Sometimes I push myself to get rid of two items for each one that I add to my clothes closet, kitchen, or book shelves to make sure I’m slowly cutting down, instead of accumulating. This is more of a mindset shift than a daily habit, but can really transform the way you spend money on material possessions. 5. Setting a spending waiting period. In addition to buying less, creating a rule that you must wait a minimum of 24 hours before buying anything over a certain amount, such as $50 or $100, is a key micro habit for financial success. By “sleeping on it,” you decide with a clear mind if buying a discretionary item is a need, or just a random impulse purchase. Often, you’ll have a change of heart and realize you didn’t need or want it anyway. If you’re shopping in a brick and mortar store and find something you want over your price limit, take a picture of it and its price. You can revisit the item at least 24 hours later and even take the time to do comparison shopping online. I also recommend calculating what an item costs you in time. Here’s a shortcut to convert your annual income into an hourly rate: If you earn $50,000 a year, shorten it to $50, then take half, which equals $25 per hour. So, if a new pair of boots cost $250, earning $25 per hour means they’d cost you 10 hours of work—before taxes. Are new boots worth the equivalent of a long workday? Only you can decide. Doing time value calculations and waiting 24 hours are micro habits that can instantly reframe how you think about making a purchase. A micro habit that you can put on autopilot is automating savings and investments. The idea is that what you don’t see in your bank account, you can’t spend. That’s why workplace retirement plans with automatic payroll deductions, such as 401ks or 403bs, work so well. So, contribute as much as you can at work, or create a recurring transfer to move money from your checking to an IRA or bank savings account, as soon as you’re paid. It’s okay to start small. Even investing $50 a month is better than nothing. If you invested that much for 40 years and earned a conservative 6% return, you’d have $100,000. Creating your accounts and setting the savings automation infrastructure is what’s most important to build wealth and move your finances in a positive direction. Free Resource: For more clarification about the pros and cons of different retirement accounts, download the Retirement Account Comparison Chart (PDF), a handy reference tool that explains the rules on one page. 7. Saying “no” more often. Saying “no” to negative people or invitations that don’t align with your goals is a wise micro habit to develop. It can be much harder to do the right things when you’re around other people’s drama and conflicts. The people you surround yourself with have a major influence over who you become. So, don’t let negative influences penetrate your mind. Stay true to who you are and what you want to accomplish. Instead of acting unconsciously and being jerked around by unproductive impulses, use these tiny micro habits to ease into a new world of positive behaviors and outcomes.